LAWRENCE — Mahasweta Banerjee, professor of social welfare at the University of Kansas, has received the George & Eleanor Woodyard International Educator Award in recognition for her long-term dedication to international education. The Office of International Programs coordinates this award, which recognizes outstanding contributions in teaching, research and service that significantly strengthen the university's international dimension. Banerjee was recognized for her consistent commitment to international education and research through her numerous study abroad programs, regular incorporation of international material into her courses, internationally focused research, extensive collaboration with other researchers abroad and leadership in internationalization efforts on campus and professional organizations. Throughout her nearly 25-year career at KU, Banerjee has promoted international education content and programs in the School of Social Welfare. She was a Fulbright senior researcher in India in 2007-08. She has led a study abroad course on social work in India in partnership with Tata Institute of Social Sciences since 2006. Her scholarly work (more than 50 publications and more than 60 presentations) advances international education on local, national and international levels. Banerjee has mentored several KU doctoral students in various capacities, and she has served as an international external examiner for six dissertations in India. 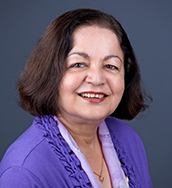 Banerjee has also made important contributions to the internationalization of her discipline, including developing resources for social workers interested in cultural competency and international social work practice.